Sunny and warm, Water temperature 75* and Clear. I got out very early this morning, caught bait and picked the guys up at High Point. I looked for fish for about 10 minutes and found enough to set up on. 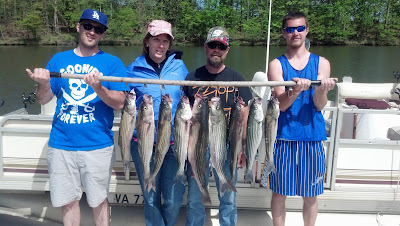 We put our first set out and caught 15 Stripers in less than 30 minutes. We were on our way to a fun morning. Today we hit school after school picking 8 to 10 fish out of each stop we made. Today we took about 200 hits and caught about 50 Stripers. Collin is going to remember this trip for a long time. He went from not touching a bait and having difficulty reeling in fish to changing his own baits, setting the lines out and spanking a lot of nice Stripers today. Caught the better fish today on Cicadas. This is a picture off of a HDS-12 with traditional sonar on the upper half of the screen and Side Scan on the bottom half. DP was collecting bait for a trip early in the morning. 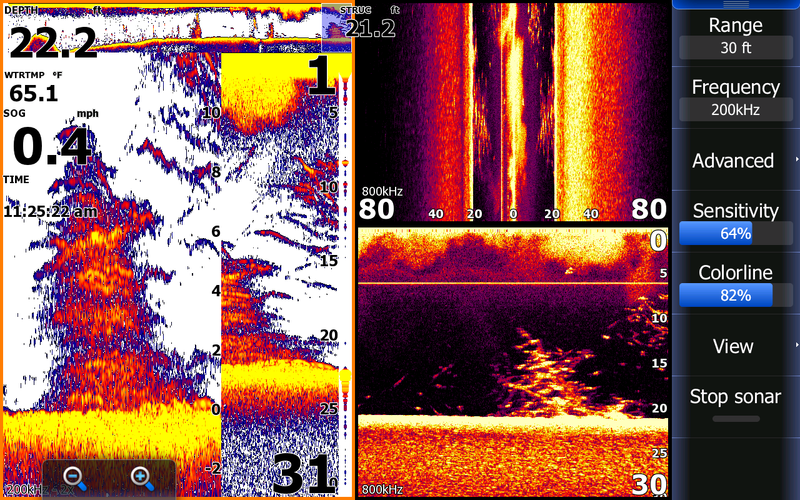 In the sonar portion of the picture the boat is over 35 feet of water and shows some small Stripers in the upper water column with plankton stratified between 20 to 25 feet on the left side and on the bottom on the right side of the sonar screen. 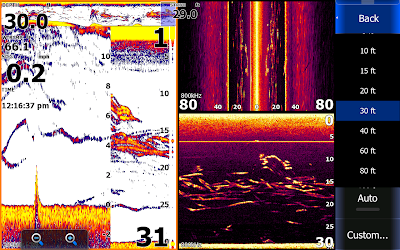 Very little bait is showing up on the sonar. The bottom half of the picture shows Side scan in a 60 foot scale [looking out 60 feet to the right and left side of the boat]. 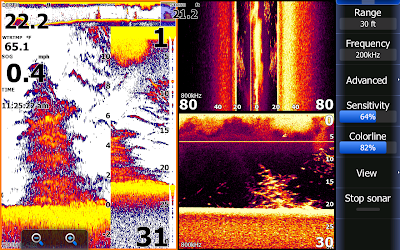 It clearly shows bait to the left of the boat. 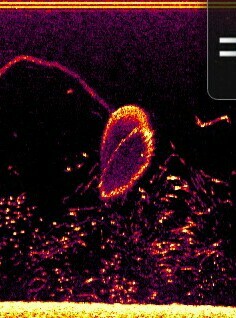 It also shows very clearly DP's 10 foot net and rope sinking into the bait. At this point there was one bait in the net but after letting it fall he caught about 2 dozen baits. We use this technology daily not only catching bait but also while we are on fish to track the direction the schools are moving. This is a cropped view of the picture above showing the net falling into the bait. 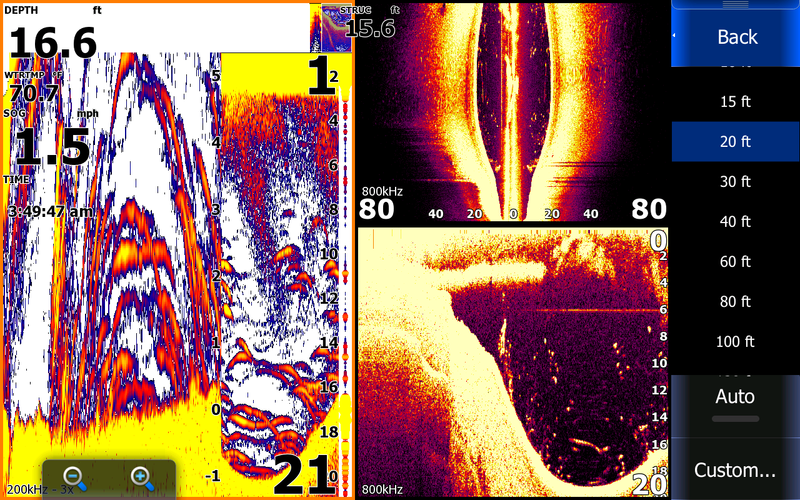 This screen shot shows traditional sonar on the left side of the screen, side scan on the upper right and bottom scan on the bottom right of the screen. 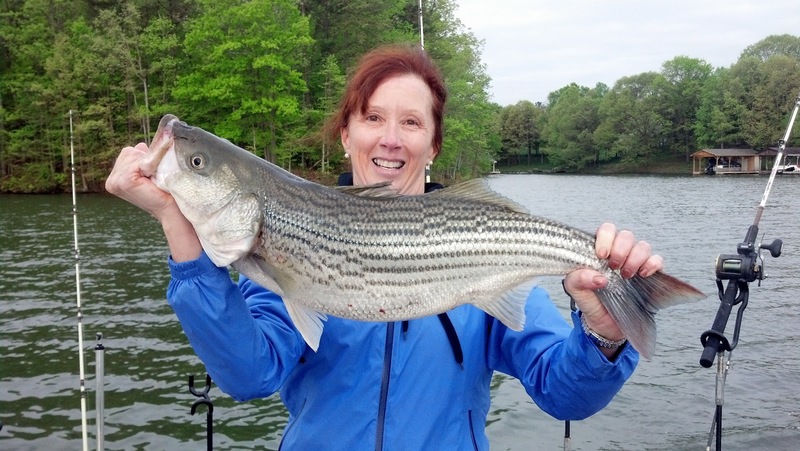 The Stripers are suspended between 22 to 35 feet. The line in the middle of the pic is us dropping our bait down through the Stripers. On the side scan you can see Stripers not only under our boat but more Stripers to the left side of the boat. 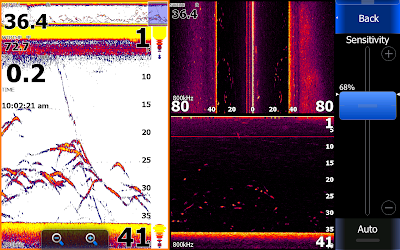 Down scan is simply is confirming the fish under the boat. We caught about 15 fish in just a few minutes while fishing this school. 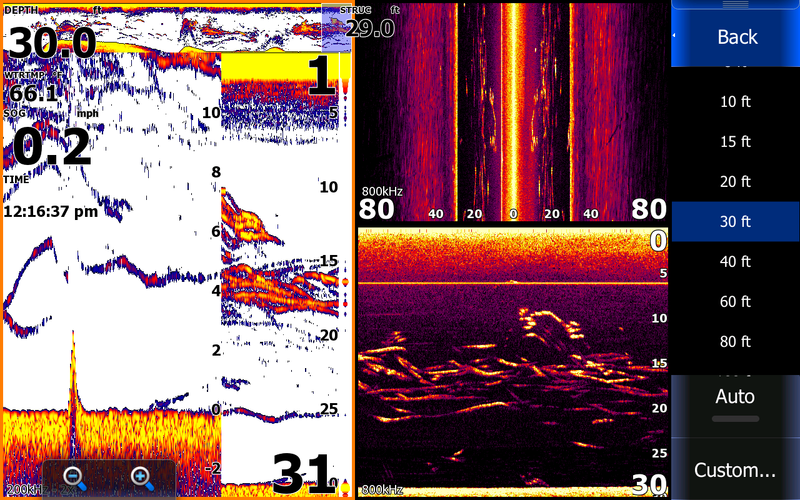 If you look at the upper portion of my sonar it shows my history of the previous few minutes. The purplish square is the same as the current sonar and the further you look back to the left the further back in time we go. With the touch screen I can simply touch any area in the history, it pulls the screens back to that moment so I can view what I previously went over and if I wish I could touch that area again and way-point it to return to the exact spot. This shot of my Lowrance shows the boat in 16 feet of water. This is a massive school of bait. We threw the net and caught about 60 beautiful baits. 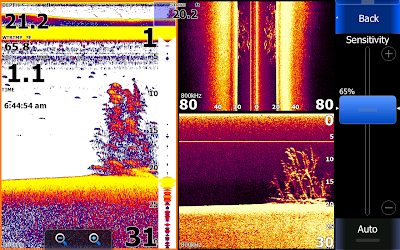 This picture shows a brush pile with a school of Crappie suspended just above and to the right of the pile. This is a school of Stripers that we worked that were suspended in 15 to 20 feet of water. This is a brush pile that rises off the bottom about 12 feet. This is a hole in a flat that if work quite often. There are 4 screens on the Lowrance. The extreem left screen is in bottom lock at 3x zoom. 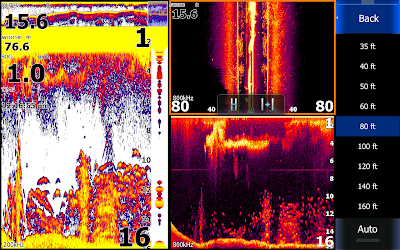 The next part of the screen is traditional sonar showing Stripers near the bottom with gizzards above the fish. 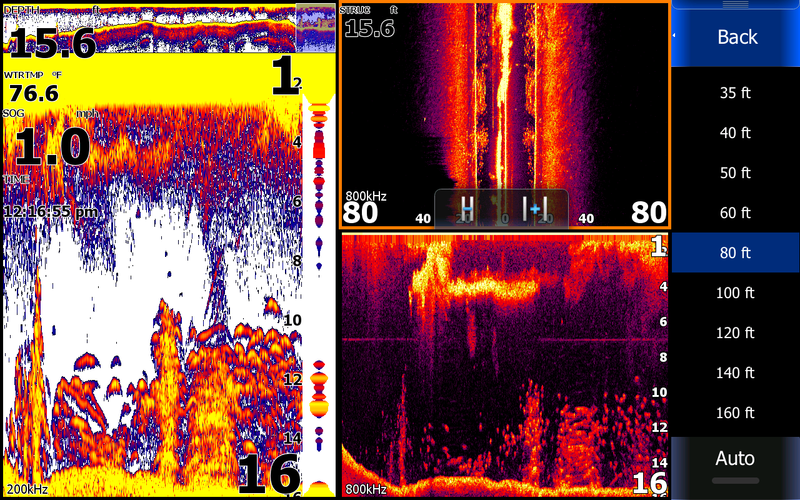 The bottom right screen is downscan showing a clear picture of the fish and bait. Sunny and Pleasant, Water Temperature 70*and Clear. I got out very early and caught bait then picked up my clients at 5:15 at High Point. We made a short run and I put out a set of 10 planner boards and 6 or 8 downlines pulling flats. We had an earthquake yesterday and I was wondering if it would affect the fishing today like it did a couple years ago. [When we had the earthquake and aftershocks we would only catch half the fish that we were normally catching.] I put my boards up on the bank expecting to catch the fish shallow but we only took a couple hit the first 20 minutes of the morning but when I pulled out a little deeper we started getting Jammed. The guys didn't expect that kind of action and they were quite shell-shocked by 7:10 this morning. We had taken 100 hits and put over 30 fish in the boat! Our boating ratios were down because we had a clown on the boat today that thought he could do it his way. After loosing too many fish to count and knocking the largest fish of the day off his sons hook with the net he settled down somewhat resulting in us landing more fish. We left at 7:20 and looked for some more fish and bait then picked up Bill at the docks around 8. We fished the rest of the day but never had the kind of action that we had in the morning. 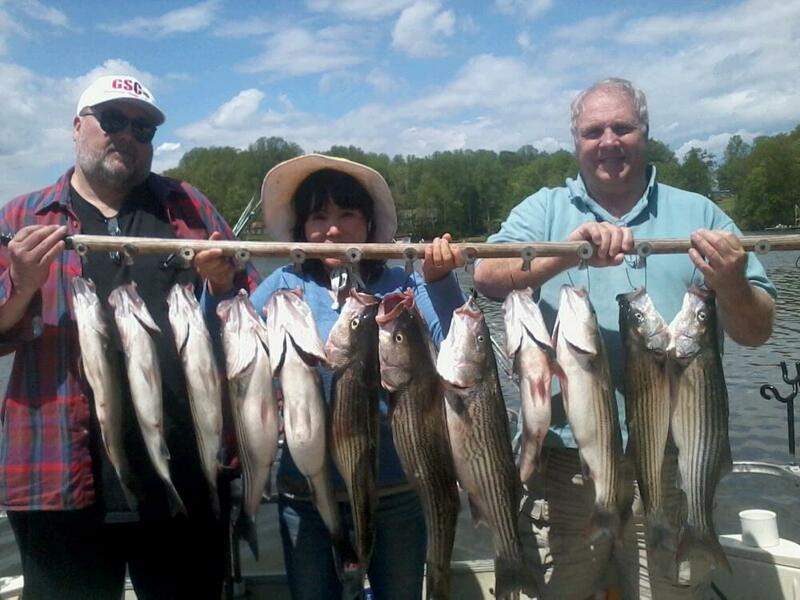 It sure was a lot of fun for all of us today, we boated well over 50 Stripers, a couple Bass and a few Catfish. Sunny, cold in the morning , Water temperature 66* and clear. Today I got out early and caught bait so that we could have our spread out at first light. I caught the bait but one of the guys was late because he had to work till after 2 last night. We started to put our spread out around 6 but it was already too late, I could only get a bait or two out before it got hit. [I wanted to have 15 lines in the water so when the fish turned on we could have numerous hook-ups] We had constant action for about an hour, that is when I finally got all my rods baited. We hit areas nearby and picked up a few fish but the major feed was over. I set up over a few more areas before I had to take William back early to the dock so he could go to the airport. I popped a quick picture of him with a few fish, threw the fish in a cooler and sent him down the road. We went back out but our good luck charm had left us, seemed William on board was the key to catching fish. We fished different areas for 4 more hours only to catch punks and a few keepers. At 2 I decided to look for some fish in a different area and the move paid off. We had to get off the water by 3 and we had about 35 baits left. We baited our hooks and the madness began. For the next hour we had constant hook-ups and used every single bait in our tanks. We got back to the dock and snapped a quick picture of the guys holding a couple of fish each from the livewell then they had to rush off. Today we caught over 40 Stripers and a few catfish. The cold front had positioned the fish out near or over the channel today making it difficult to catch everything we saw on my Lowrance. Daren is pictured holding a couple of the fish we caught early this morning. This being Mothers Day Tony and I thought we would let the "Moms" sleep in so we woke up Tony's son Alec and my grandson Michael and took them fishing for a few hours this morning. Michael is pictured holding up a very nice Bass he caught and in the bottom picture both boys are doing battle with two Stripers at the same time. 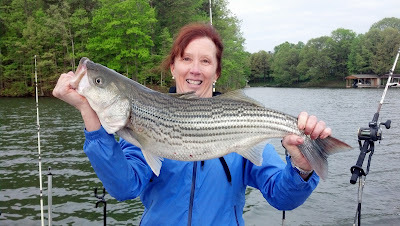 In the first 45 minutes of the morning they landed a dozen Stripers. 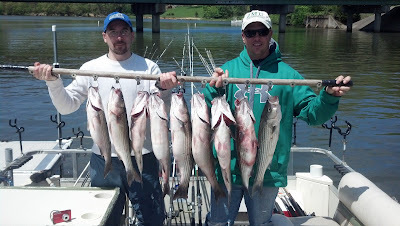 Guide DP took these guys out today for a morning of Striper fishing and looks like they had plenty of action. Rainy morning turning into pleasant afternoon, Water temperature 66* and Stained. Tony and myself both had trips this morning so we hit the water at 4am, caught bait and picked our clients up at the crack of dawn. Tony worked one side of the lake and I hit the other side. We both pulled big spreads of planner boards rigged with big Gizz. 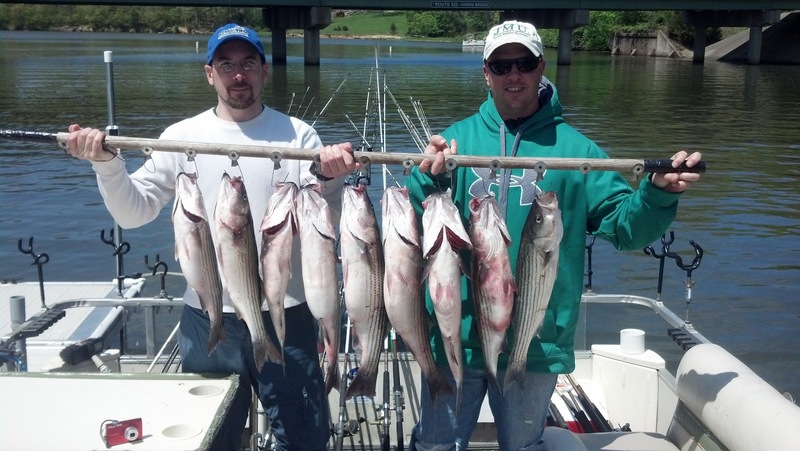 Both boats caught 20 Stripers each and everyone went home with great Memories and good table-fare. Fishing was spotty today, there were times of chaos when every rod would get hit as well as times of 30 to 45 minutes of no action. The weather probably had a lot to do with the action today. DP took Rich and Chad out Sunday for a great day of fishing. 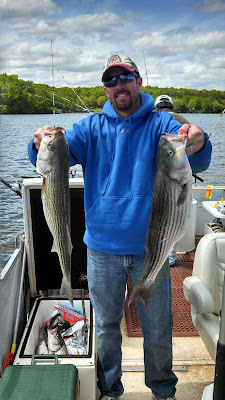 Here is Matt holding up a couple nice Stripers from our trip on Friday. This is Dr. Frank Lewis holding a Citation bass that he caught fishing with me on Thursday. DP took Rory Sullivan and his family out today for a great day on the water. Pat showed the Boys how it was done by catching the big fish of the day. Dan took his family out today to catch some fish and to celebrate his birthday. Dan not only caught the largest Striper of the day but also a beautiful Largemouth Bass. We boated well over 20 fish today for a enjoyable day on the water. What a great way to spend your birthday, beautiful weather, great fishing and a wonderful time with your family and Pastor.